Eiji Aonuma admits that the drastic leap in art direction he took with Wind Waker was perhaps a bit too drastic. Zelda series producer Eiji Aonuma recently told Games TM magazine that Nintendo will have to be a bit more careful with the series' artstyle in the future, owing the the large negative reaction surrounding The Wind Waker's initial release on Gamecube. "We encountered an awful lot of problems from the drastic leap we took with Wind Waker," Aonuma admitted, explaining that until they find an approach that makes both developers and users happy, they probably won't be "breaking new ground" with the series. "I think we will be a bit more careful in the future, but if we find a new approach that not just the developers, but also the users would enjoy then I think we will want to break new ground again. But we haven't found such an approach yet." 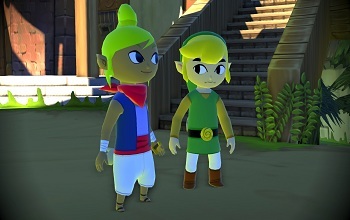 The Wind Waker, which was first release on the Gamecube back in 2003, initially saw some pretty heated negative reactions from fans, who disliked the cell-shaded "cartoony" art-style. A HD re-release for the Wii U was recently release, however, and saw praise from both critics and fans alike. Last we heard of the as-of-yet-untitled upcoming new Zelda title for the Wii U, Nintendo still hadn't settled on an artstyle. Back in June, Aonuma stated that the game wouldn't be ultra-realistic, but wouldn't be "cartoony realistic" either, and has noted on a number of occasions that the Zelda tech demo shown at E3 2011 is not representative of how the game will look. Just, don't go expecting it to break new ground in terms of art style.